Team D3 Go! - Brock Parker - D3 Go! Today we introduce Team D3 Go! member Brock Parker. These members are sponsored Magic: The Gathering – Puzzle Quest players at Pro Tour events in 2017. Please follow them on Twitter and watch them compete at events via Twitch. And don’t forget, Pro Tour Amonkhet starts in Nashville on May 12th! 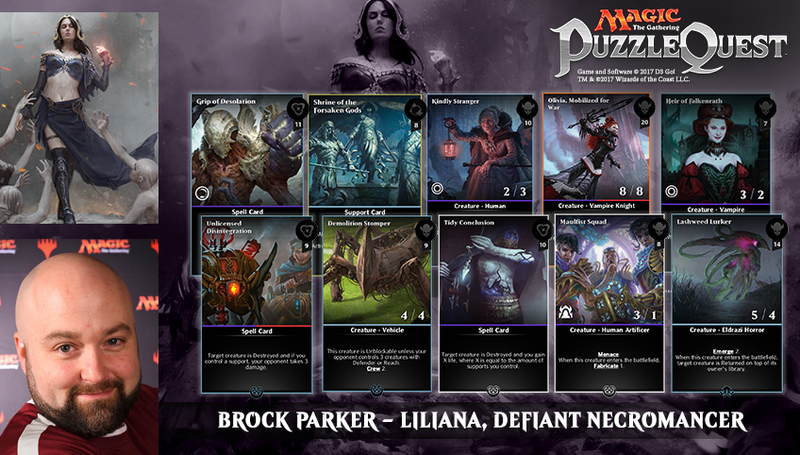 Your Go-To Magic: Puzzle Quest Deck for this Planeswalker: Shrine of the Forsaken Gods, Grip of Desolation, Unlicensed Disintegration, Tidy Conclusion, Heir of Falkenrath, Maulfist Squad, Kindly Stranger, Demolition Stomper, Lashweek Lurker, Olivia, Mobilized for War. I like to be able to control the board and my opponents hand. At level 60, Liliana’s first two abilities are great at doing this, while her third is great at closing out a game quickly. Olivia, Mobilized for War is the most powerful card I’ve acquired to date and a handful of creature removal is always nice.